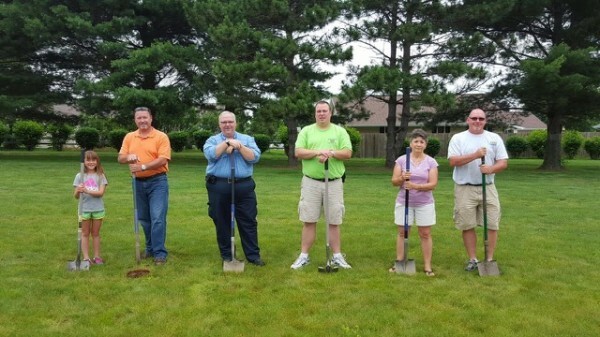 Members of the Argos Town Council and the Argos Parks and Recreation Board met the afternoon of June 17, to break ground for the 1,000 square foot splash pad that will be built yet this summer. Those pictured from left are Morgan Barcus, daughter of Ed Barcus); Ed Barcus, president of the Argos Parks and Recreation Board. Jim Burroughs, Argos Utilities superintendent; Mark Vanderweele, Argos Town Council president; Suzanne Umbaugh, Argos Town Council vice president; and Joe Stone, Argos Parks and Recreation Board member. The splash pad was a community project and was funded with grant monies from the Marshall County Community Foundation along with private and public donations.